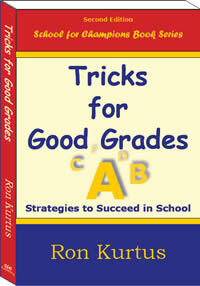 Tricks for Good Grades provides common sense strategies to succeed in school. It explains methods for students to study better, do well in tests, get along with their teachers, and solve problems students often have. Some students get great grades. These kids are usually smart and maybe even charming. The teachers like them. Other students are highly disciplined and work long hours to maintain their high grades. Some just have a knack for getting the right answers on the tests. But most students aren't like those special ones. Most have to struggle in school. Some have problems understanding things. Others get anxious and nervous before and during tests. You may be one of these students. Do you want to get better grades in school? Do you want to be able to learn things easier, so you've got more time for enjoyment? Do you want to feel great about yourself in the process, like a champion? This book is meant for you. Go through the lessons in this book to find helpful methods and tips on doing well in school. They will help you get more out of your school experience. The goal of this book is to design champions. We want to see you become a leader, a winner, and a success in school and in life. The book is divided into several sections or areas of interest. The first area explains the basics of getting good grades. It also points out the pros and cons of cheating to get better grades. Opinions of various students are included to show what other kids think. Homework is a major time-consumer in school. We advocate zipping through your homework and not trying to watch television or talk on the phone at the same time. There are some good techniques that will help you complete your homework. Test scores are a major part of your final grade in a class. Learning to effectively take tests and exams is a skill that every student wanting better grades should learn. There are a number of important factors and ideas to improve your test-taking abilities explained in this section. There are good teachers and some bad teachers in every school. Hopefully, you don’t get stuck with a bad or even mean teacher. But if you do, you need to learn to handle the situation. We give some good tips on how to do that. Being able to give presentations and ways to increase your learning skills are also explained. Finally, there are some that are worth noting. These are the basis of the School for Champions and can be applied to students in school. Hopefully, this book will guide you to be a top student. You want to do as good as you can in school and become a champion in the process. Retail price $15.95. Purchase online through Lulu booksellers for only $12.94. Check it out! You can also get the book through Amazon.com.